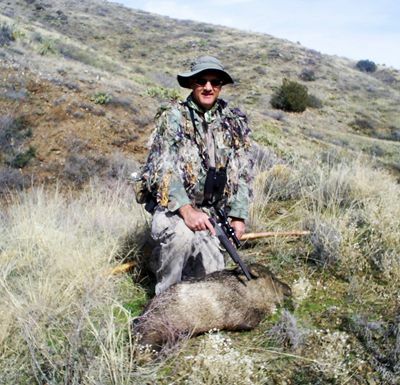 It is a fine treat to begin a new year going after javelina with a holster gun. If you got drawn, that is. Daniel, Mike and I had tags, for 20A again. We, or more accurately, I, chose demanding but familiar terrain as usual, with elevations around four thousand feet. The weather is always a factor. Pigs don’t stay out in the rain, of which there was plenty in the forecast. Personally I’d rather have it that way than struggle in horrid heat. And in February anything over 85F is horrid to me. No, for the 2009 opener every weather station promised some wet stuff. On opening morning we found only old sign. Several deer at least provided some entertainment. After lunch I decided to push the issue. Up near the crest of the mountain range things were too brushy to really hunt or sneak along. I plowed through there anyway. Sure enough, soon I heard other noises than me crushing through waste-high growth. Pigs! Eventually I saw them, already on the opposite side of the next ravine, maybe eighty steps ahead. Out came the Contender, only to have the little desert ghosts disappear for good right before my cross hairs caught up with them. I followed their path. But it was the familiar ‘never again’ story. None of us found any more of the critters that day. It got worse. Daniel came down with the flu, and Mike anticipated a rainy night and opted to leave for home with Daniel that Friday evening. I stayed. I absolutely love the rugged wild steep country here. It does tax your legs and lungs to hunt there, and maybe because of that nobody else was around. Javelina, by the way, seem to: a) stay hidden so you’ll never see one – okay, except during deer season; b) quit the area code in a hurry as you stumble upon them – here a revolver or auto may come in handy to further convince them that their plan is a good one; c) be in serious trouble as you happen to detect one of them from a distance, and can plan and execute your approach carefully – by far the preferred scenario, hence do bring binoculars. And just because you don’t see them does not mean there aren’t any. Clouds did come that night. Saturday morning threatened with showers. I packed a rain coat and headed out. After only a half hour I was following fresh tracks. Such conditions inject tremendous doses of anticipation and hope. Once it became clear what hill these tracks were leading for, I made what turned out to be a mistake. Dreams of heading them off led me around that hill in the opposite direction. This did put the winds into my face. But after about two hours of carefully maneuvering the steep and brushy hill I returned to within not even a hundred yards of where I had abandoned those fresh tracks. Of course, that’s when one pig showed up, stopping about twenty yards from me, but behind some bushes, and heading for thicker vegetation. Mistake number two… I slowly drew my 45 Auto and fired. The pig fled, followed by a second. Neither presented another shot. My (lack of) crime scene investigation revealed why the beast got so lucky. That 45 slug had cut a twig some seven steps from the muzzle, and then gone anywhere except near the critter. Since that first javelina really wasn’t all that alarmed the better plan would have been to wait. Rarely do these desert ghosts show up alone. The second one may have eventually presented a better opportunity. Now they were both outta there, in a hurry. I did not find any others that day, despite covering a lot of brush, and not even a sprinkle. But the clouds thickened. So I returned to the city to let the rain do its thing. After consulting the weather forecast daily, Daniel and I decided to invest one more vacation day. We returned Wednesday, to find that much of the precipitation from the previous days had come down as snow. North-facing slopes had quite a bit left. At first light it was cold, and the ground frozen solid. There was no new sign. We neither saw nor heard them from several vantage points. Now he could see them as well, three porkers in a small opening, a good half mile away. We had the advantage, made our plan. The stalk was on. As we approached to within about two hundred paces of where we had seen them, they were gone. Knowing that they must be around we searched with binoculars, and detected them again, now four – no, five, near and in a dry watering tank. That gave us two options: Keep going along the slope we were on, which kept us above them and where we could watch them. But due to the open country, we probably would not get to within fifty steps. Daniel was armed with a 4-inch .357 Magnum. Therefore I suggested we drop back, and down, follow the bottom of the wash and ambush them over the berm of the tank. The wind wasn’t in favor of that, plus Daniel had concerns that the thicker vegetation in the wash may reveal us through too much noise. So we inched along the slope. We made it to only within about a hundred paces when one of the javelina froze, obviously having detected something. We froze as well, a standoff that lasted many uncomfortable minutes before the beast relaxed and resumed feeding. We called that little interlude ‘close enough’, and sat down. Due to the distance for the anticipated shot I handed the Contender to Daniel since he hadn’t killed big game before. Now where he was ready, all critters had vanished from view. Oh they were still in that dry tank alright, but the vegetation had swallowed them whole. A seemingly very long time passed. We had earplugs in, and extra ammo placed strategically between us. Finally one of them appeared in the open again, now on the inside of the berm, closer to us. This would unleash several minutes of mayhem. When the .30 Herrett boomed, the intended pig stumbled backwards down the berm, and out of our view. The others exploded in blind panic, more than I had anticipated. Two seasons prior, in a similar situation, none ran quite that far after my first shot. But this was now, and I yanked the big scoped pistol out of Daniel’s hands. I frantically loaded a fresh 110 grain Spirepoint that after twelve inches of travel would leave the muzzle at an unhealthy 2350 fps. I then leveled down on a fat-looking porker that had stopped on the edge of protection-offering thick brush to sort things out. The crosshairs bounced around annoyingly. When I squeezed, it was probably more of a jerk, such that the bullet found what turned out to be the lower right front leg. My javelina charged forward, only a few steps, still in the open, back hair fully erect. Even more excited now, I fumbled the next cartridge into the chamber, then missed. The pig moved a few more steps, now back on top of the berm. My next shot hit it higher in the same leg, as it turned out. That, at least, slowed him way down. Except that in this moment Daniel’s critter re-appeared from the bottom of the tank. He greeted it with .357 fire, while I, now more calm, finally put my javelina down with a low hit through both shoulders that also went through the very front of the chest cavity. I reloaded the TC, handed it to Daniel as all javelina had now dramatically increased the distance from us. He fired a few times until all were safely over the next hill. Between his revolver and the Herrett some total of at least thirteen rounds had severely upset the critters’ lunch break. Unfortunately, Daniel had not touched any of them. There was no other pig down at the tank, no other blood anywhere. So he followed the fugitives while I said my thanks, then field dressed my boar. The transport to the nearest road wasn’t too bad this time. There my boar got to rest under a bush in the shade, and the TC under another, while I made the trip back through the canyon to get my Toyota. This hike revealed again the rugged wild beauty of this steep country. I was thankful to be in it, harvest from it, recharge, bathed by a cold breeze, protected by an occasional cloud, fully enjoying it all. An hour and a half later I returned. My boar got the familiar treatment. Soon he was hanging off the hatch on my 4Runner, cooling nicely in the forty degree breeze. By the time Daniel returned also – he never caught up with the pigs again – the meat was ready for the ice chest. Our slow ride back out provided possibility of finding javelina for about five miles, but we did not detect any. Why that one javelina behaved as if it had been hit hard by Daniel’s first shot remains a mystery. 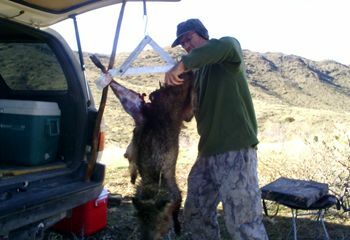 Still, Daniel told me on the way home that it was a blast to go after javelina with handguns. We’ll try this again, lottery odds willing.